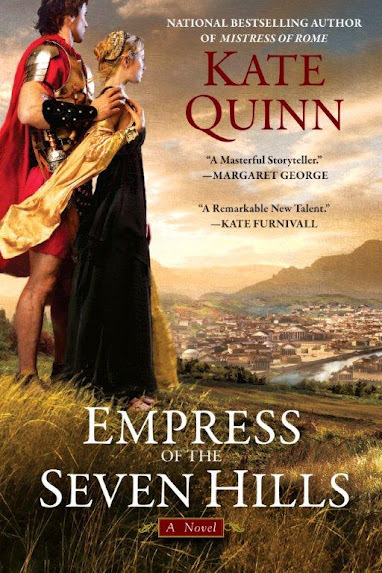 From the national bestselling author of Daughters of Rome and Mistress of Rome comes a tale of love, power, and intrigue spanning the wilds of the Empire to the seven hills of Rome. Brash and headstrong, Vix is a celebrated ex-gladiator returned to Rome to make his fortune. The sinuous, elusive Sabina is a senator's daughter who craves adventure. Sometimes lovers, sometimes enemies, Vix and Sabina are united by their devotion to Trajan. But others are already maneuvering in the shadows. Trajan's ambitious Empress has her own plans for Sabina. And the aristocratic Hadrian-the Empress's ruthless protégé and Vix's mortal enemy-has ambitions he confesses to no one, ambitions rooted in a secret prophecy. No one does Ancient Rome quite like author Kate Quinn and her third novel, Empress of the Seven Hills, is yet another shining example of historical fiction done right! Vix is the son of Thea from Quinn’s first novel, Mistress of Rome, and the feisty boy we met previously has grown into a headstrong, obstinate man with a loyal heart…I fell in love with him instantly! Sabina is equally headstrong. She’s a woman who knows what she wants out of life and goes after it, but not in a conniving, scheming manner like Empress Plotina, but rather as an impressive and inspiringly independent woman. Though their passion for each other ebbs and flows throughout the novel, their mutual love for Emperor Trajan unites them against others who threaten his rule and the Empire. Kate’s talent at writing characters in such a way that the reader becomes totally invested in them is one of her greatest strengths, in my opinion. Combine that with her flawless writing, extensive research and an intriguing, action-packed plot and you’ve got one hell of a read...one that I can't recommend enough! Quinn ends the book with a hint of a sequel and I can’t wait to see what more is in store for Vix and Sabina! Sounds like a great book - thank you for the review. Mistress of Rome is waiting for me at the library. I am looking forward to reading on in this series! Mistress of Rome and now this one!